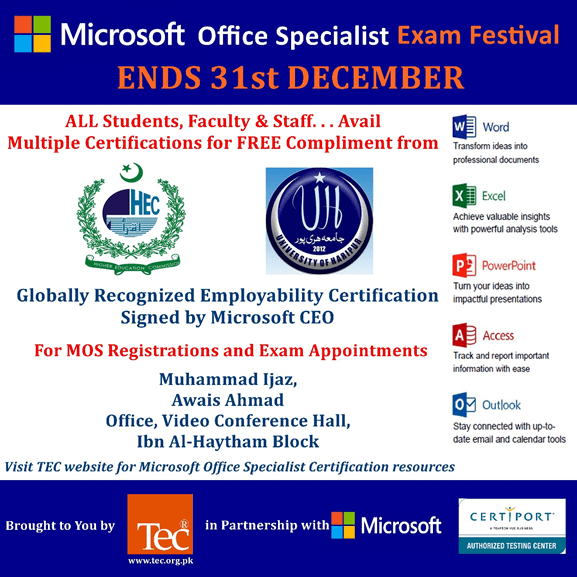 Higher Education Commission, Pakistan (HEC) new project-based testing for MOS 2013 provides industry-leading assessments of skills and knowledge, giving students and professionals real-world exercises to appraise their understanding of Microsoft Office. This guarantees that every certified user has demonstrated the ability to command the full features and functionality of Microsoft Office, preparing them for future academic or workforce opportunities. LEARN how to use Microsoft Office using content-rich materials including textbooks, online eCourseware, and video resources. PRACTICE using interactive exam preparation tools and practice exams. CERTIFY and validate skills taking Certiport performance-based exams. Note: Once registered please remember your login IDs and contact the focal person for exam appointments.